Nothing tops that post-yoga sense of peace. Whatever frazzled state you're in, when you walk out of a class you'll feel powerful, energised... and insufferably blissful. Everyone deserves to retreat from the hassles of urban life, and a weekly yoga session provides this respite like nothing else. The ancient Buddhist practice has many modern incarnations in the capital. We've handpicked the best places to do yoga in London. Indaba is a truly exceptional London yoga studio. It combines a chummy, welcoming community spirit - you'll be greeted on first name terms after just one class - with luxurious surroundings. Fresh flowers, thick carpets, imported incense, winking candles, cool music (strictly no whale singing) and studios so clean the Princess of Thailand picked them out for London sessions: this is a far cry from Downward Facing Dog in a chlorine-stinking gym attic. There are two spacious studios, which can fit up to 70, though evening classes average around 30. There are lovely changing rooms with lockers, individual shower cabins and beautiful smelling shampoo and conditioners, as well as hairdryers for post-class preening. Clients can rent towels and purchase snacks and drinks. However, complimentary tea is also available to all guests throughout the day. Clean yoga mats and various props are provided free of charge. There's also a top-notch shop, where you can purchase some of Indaba's loveliness and take it home. Introductory Offer £35 for 10 consecutive days of unlimited yoga classes. Click here to read about more offers. This luxurious Covent Garden hide-out offers an unusually broad range of classes; you can choose between traditional forms like Ashtanga, Flow, Vinyasa and Yin, or lesser known practices like Dharma Mittra and Mysore. There are two ultra-modern studios, one hot, one temperate. Both have big windows and lots of natural light, but we love the evening classes when the candles and incense come out. The showers are lovely and stocked with complimentary toiletries, but make sure you hurry there, as the changing rooms are on the dinkier side and there can be queues, especially in the evenings. Arriving at least 5 minutes before the classes is good etiquette. Friendly, reasonably priced and centrally located, Yotopia is the perfect post-work, pre-drinks Oasis. Classes start at £16 each, with an introductory offer of £35 for 20 days. For more information click here. 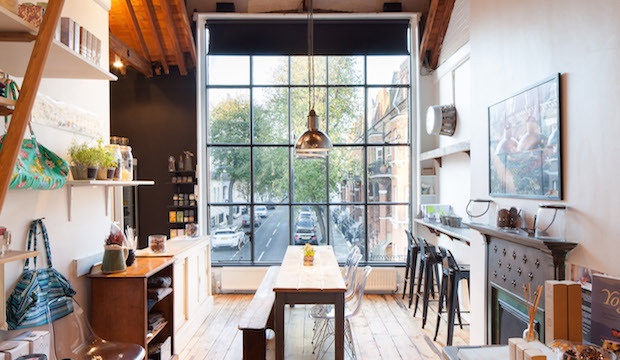 With its glass walls, enormous windows and recent refurbishment with the help of a local antiques dealer, Power Yoga company has to be the most gorgeous yoga centre in London. Housed in a former artist's studio on a quiet street, the centre specialises in dynamic power-yoga. This is a slightly more challenging practice, but the centre caters for all levels, so you'll never feel out of your depth. As well as Power Yoga, the centre offers yin yoga and Chakra restorative classes and the kids' sessions are some of the best in London. Instructor Serena Lillingston teaches kids aged 8 – 11 years on Wednesdays at 4:45. The in-house juice bar is one of the best around - and you have to try the seeded rye bread with avocado, lemon, pink Himalayan salt, cayenne pepper and olive oil. Special introductory rate: 3 classes for £15 and receive 15% off on any hourly pass purchased. Click here for more details. Kate Moss, Jade Jagger and Thandi Newton are devotees of the Kensal Road studio, and thousands of people around the world have chosen Jivamukti as a way of life This yoga method combines dynamic Asana yoga with spiritual practices such as meditation, devotional chanting and study of the ancient texts. The physically and intellectually-challenging classes last 60-90 minutes, and are open to all levels. Just off Ladbroke Grove, the studio is beautiful and the complimentary toiletries and tea are a lovely touch. Introductory offer: £40 for 30 consecutive days of classes. Click here for more info. Evolve is a lovely little boutique studio, tucked away on a quiet South Ken Mews. The centre has three studios and teaches a huge variety of yoga styles in small classes. Yoga is only half the story: the centre hosts workshops, events and talks on well-being, as well as a huge range of courses and treatments. Don't miss special events like the shamanistic cacao ceremonies, cleansing gong-baths which 'bathe the body in sound', promoting inner peace and cleansing the chakras. Oh, and the complimentary products are fabulous, too. 9 Eccleston Street, London SW1W 9LX. The Light Centre is a haven of natural health in Belgravia, offering a huge range of ayurvedic, massage and homeopathic therapies, alongside 70 yoga and pilates classes per week. There are two studios, the larger comfortably fits 30, while the smaller studio upstairs fits 22. The classes are vary reasonable, and vary in length from 45 minutes to 1 hour 40 minutes. The Light Centre's yogis are some of the best in London; look out for teachers Amanda Denton, Marcus Veda and Catia Leite. The centre opens at 6:15am for Ashtanga mindfulness, and its closes at 9:30pm; later than most London yoga studios. Head to the adjoining Crussh cafe post-session for a crisp, clean pick-me-up. As well as a second, Moorgate-based studio, look out for the Light Centre Monument, the third studio by The Light Centre, open in spring 2017. Classes start at £13 or try an introductory offer of 2 weeks of classes for £30. Click here for more information. The Square Mile is the last place on earth you'd expect to find an oasis of tranquility. And yet, a stone's throw from the bustle of Moorgate, Blue Cow Yoga offers busy professionals the chance to wipe out the stresses of the day. The studio is a collaboration with Heartcore Fitness, offering Pilates and Ballet Bar classes alongside Dynamic, Flow and Restorative yoga classes. Everyone is exceptionally welcoming, there're no yoga-bunny cliques here, so whatever your level, you'll find your feet. The showers are great, and stocked with blow-driers, straighteners and toiletries, so you can head straight out for cocktails. Classes start from £16. Introductory offer of £50 for unlimited barre and yoga. Click here for more information. Is there a better place for yoga than the beautiful settings of Hyde Park? Organised by The Magazine Restaurant, Serpentine Sackler Gallery, in the summer, classes are outdoors on Sunday mornings, followed by breakfast at the restaurant. We're waiting to see whether they do it again this year. Fierce Grace is a hot yoga system, based on Hatha, Bikram and Ashtanga practices, which focuses on balancing the male and female energies. "Fierce is the male side: your strength, outwardness and force. Grace is the female side: flexibility, inwardness, breathing and surrender. A good yoga practice has exactly half and half of each" explains founder Michele Pernetta: the woman who first brought Bikram yoga to London in 1994. Pernetta has amassed a loyal following of celebrities, yogis and newcomers alike. This studio, though is a little bit different. The Hothouse acts as an academy for Fierce Grace teachers, offering a no-frills approach, free of dinky furniture, branded products, smells or bells. Each class is £10 for drop-ins. Customers need not book in advance. Introductory offer: £39 for 30 consecutive days of classes. Click here to read more. Opened just last year and founded by Cambridge graduates, Ethos is fast becoming the coolest studio in London. Here you can practise top quality yoga and top quality sport too, with barre sessions sitting alongside quality yoga instruction. Check out the 432 Hz class, where the only music played is tuned to this calming frequency. Eye pillows and comfy cushions are provided. There are swanky changing rooms and the Supernatural Cafe Bar has a terrace that's used in all seasons, overlooking the market. Perhaps the most unusual studios in London, Hotpods are inflatable hot yoga capsules that can pop up anywhere, though there's permanent London locations in Hackney, Notting Hill and Brixton. These purple, womb-like structures are designed to create a yoga den, completely separated from the outside world. The pods can fit 20 people and get to around 37 degrees- so be sure to bring a towel and some water. The Hotpod community is welcoming and non-cliquey: the focus is on making the teaching accessible and logical. The permanent locations offer showers, loos, changing rooms. Single class £14, Introductory offer one week unlimited for £15. Click here for more details.